Multicore processors are at the heart of the revolution in the world’s communications infrastructure, enabling virtualized network functions (VNFs) and the shift to cloud-based services. Industry developments including software-defined networking (SDN) and network functions virtualization (NFV) rely on server platforms with multicore processors that scale from small and medium-size business premises equipment, through the network edge to hyperscale data centers. There are now more high-performance multicore processors available for networking and data center applications than ever before, and the market is continuing to evolve. Qualcomm is acquiring NXP, and Macom plans to sell off the AppliedMicro compute business when it completes acquisition of the company early in 2017. A key challenge for equipment manufacturers and service providers is picking the right solution for both server performance and network bandwidth. Smartphones and dramatically improved connectivity have created new opportunities for service providers to replace localized applications running in enterprises and homes with cloud-based applications and services. Cloud service providers such as Facebook, Google and Microsoft now dominate architectural developments for hyperscale data centers and are delivering cost-effective services that challenge conventional telecom approaches. Communications service providers (CSPs) are running to catch up by using SDN, NFV and related technologies to replace conventional telecom equipment with virtualized functions running on servers in large data centers, telecom central office locations or within the customer premises. Software-defined WAN (SD-WAN) and virtualized CPE (vCPE) are leading examples of virtualized CSP services already being deployed. Intel has dominated the standard server platform to date, but there are now multiple vendors, including multibillion-dollar companies, that are challenging its dominance with solutions based on ARM and other processor architectures. This is a very dynamic market, with new entrants from AppliedMicro, IBM, Oracle, Qualcomm and Phytium. With server network I/O bandwidth moving from 20 Gbit/s to 50 Gbit/s, these server platforms need accelerated I/O adapters to achieve the best throughput, without overloading the main processors. Several vendors have introduced I/O processor solutions optimized for this application. Integrated multicore processors have multiple processing cores, network interfaces and hardware accelerators for security, packet processing and network virtualization handling up to 100 Gbit/s. Integrated multicore processors are available with ARM, Intel Xeon, MIPS, Power and other cores, and are ideal for the virtualized network edge and other applications where systems must provide an optimal mix of packet processing and server performance. Network processors that were originally developed to provide programmable high-speed packet processing have been replaced by integrated multicore processors for all but the most demanding applications. Many multicore processors integrate hardware acceleration engines that were originally developed for network processors. Multicore processors can be programmed in C or other high-level languages and are directly supported by multicore operating systems and applications software from companies such as 6WIND, Enea and Wind River. Multicore Processors Driving Network Virtualization: A Competitive Analysis surveys high-performance multicore processors for virtualized networking applications, including general-purpose multicore processors, integrated multicore processors, I/O processors and network processors. The report also reviews the strategy, product mix and product architectures of multicore processor, intellectual property (IP) and software vendors. As such, the report not only provides granular information on the components themselves -- of interest to chip manufacturers and purchasers -- but also provides insights into how the overall market for multicore processors is likely to develop -- of interest to a wide audience, including carriers and investors. This report covers 20 vendors, and uses information and product documentation supplied by these vendors. Interviews with most of the vendors covered were conducted during the summer of 2016. The report contains detailed information on more than 90 devices or groups of devices. The tables presented in the report were compiled using data provided during these interviews and from product documentation. Once the tables were compiled, the relevant data was provided to all the vendors for confirmation, feedback and updating. The shift to virtualized networks using SDN and NFV and the use of standard servers, either rackmount or rack scale, has created a new requirement for virtualized I/O processors. Virtualized I/O processors are based on standard network processors or multicore processors with hardware or software support for I/O virtualization protocols including VXLAN/NVGRE and Geneve. These processors offload the main server processor and are often placed on PCIe adapter cards so that they can be plugged to standard PCIe slots. 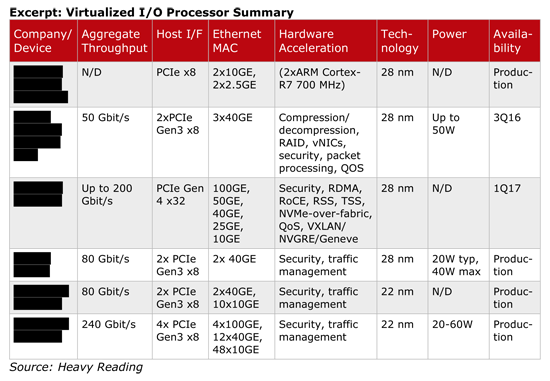 The excerpt below shows processors from five vendors that have been optimized for virtualized I/O applications. Multicore Processors Driving Network Virtualization: A Competitive Analysis is published in PDF format.